VECTORIDENT solution , vectem s.a. Essential oil concentrate of plants (eucalyptus, clove, anise, mint) to be used diluted in water as a mouthwash. - unpleasant taste in the mouth. Helps strengthen gum tissue and weaken plaque. Does not cause dental stains or yellowing. Provides a clean, fresh feeling and has a dry and pleasant taste. Instructions for use: add four drops to half a glass of water. One bottle provides 400 mouthwashes (more than 1,600 rinses). Duration based on three daily mouthwashes: more than four months. 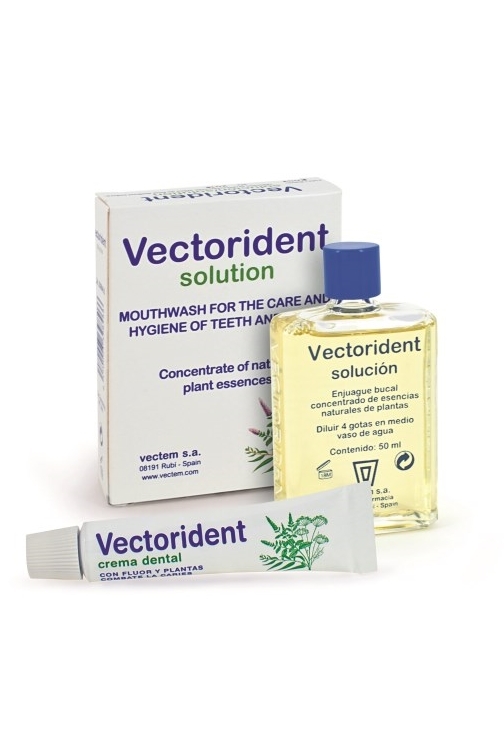 Complement with Vectorident Cream toothpaste (includes a free 10 ml sample).